Hiro (Kyoto, Japan) on 29 October 2017 in Animal & Insect. Une deuxème merceille larrière le pattes la queu sueprbe vue. Superb ! And great B&W . Interesting view. Love the abstract frame. The details are clearly visible and the B & W is strong !! Beautiful in mono and so perfectly presented. 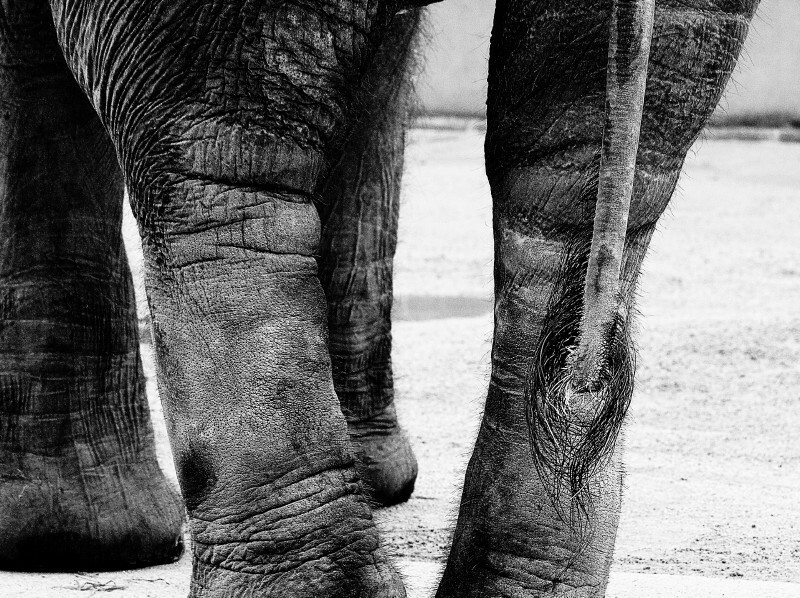 A fine capture of the naturally rough texture of this animal's legs. A fine shotl. I like the contrasts - a fabulous image. The best one I've seen here . Framing beyond the usual, and very good because of it! A fabulous image. Wonderful frame and point of view. I love the black and white and the detail. Another nice detail shot of this great animal. An excellent study of the great beast. He or she would probably enjoy running free but that is an enticing shot. Nice abstract image, great detail. great capture and nice details !! !